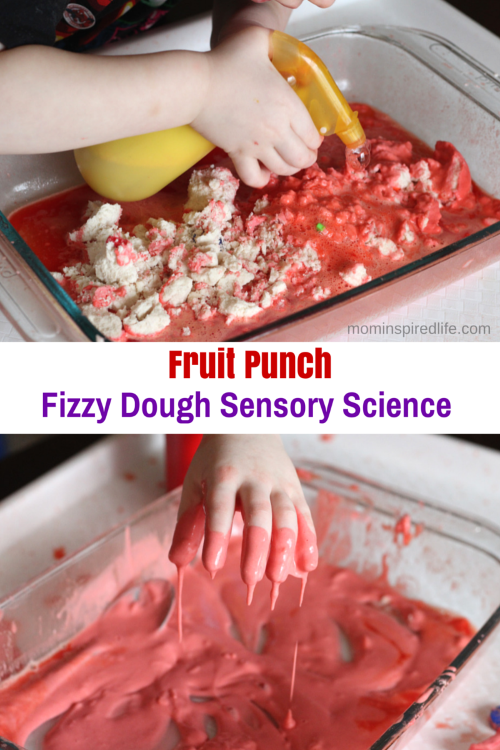 This fizzy dough sensory science activity is great for fine motor development. Kids will use all their senses and exercise their hand muscles while watching a chemical reaction take place! 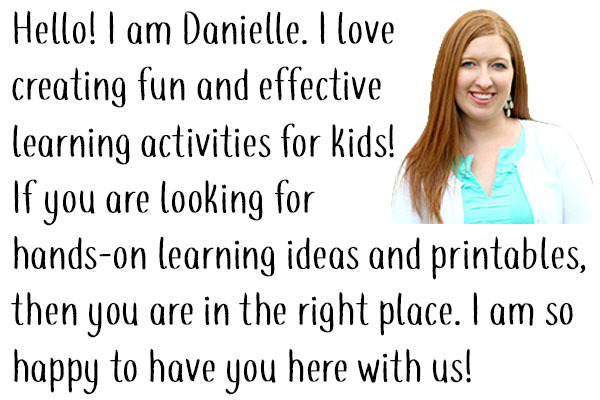 Once again I found a way to pack a ton of learning opportunities into one fun activity. 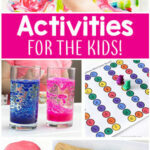 This sensory science activity is a blast for young kids! It is incredibly visually stimulating and smells absolutely divine. 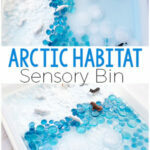 It is a sensory explosion in the best way possible! 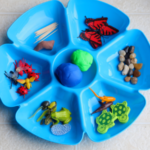 In my quest to develop Evan’s fine motor skills, I am always looking for ways to integrate a fine motor component into any activity we do. I could have used droppers or squeeze bottles, but I knew Evan would love to use a spray bottle. He ended up enjoying it way more than I even expected! 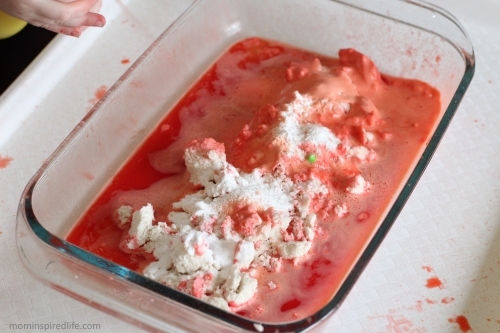 Packet of Kool-Aid – We used Fruit Punch and it smelled SO good! 1. 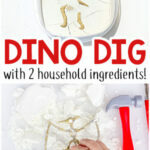 Add the baking soda, flour and oil to a large bowl and mix together with your hands. I just keep squishing and mixing with my hands until it takes on a crumbly dough consistency. 2. 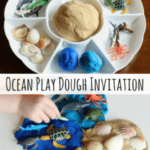 Put the dough in a large bin or 9 x 13 baking dish. 3. Add a packet of Kool-Aid to about 1.5 cups of water and stir to combine. 4. 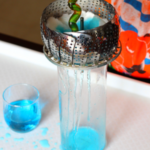 Pour the Kool-Aid mixture into a spray bottle and attach the sprayer. 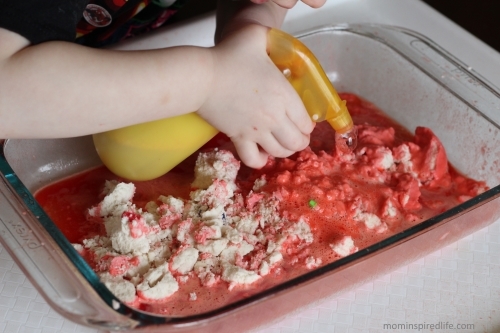 Give your child the dish full of fizzy dough and the spray bottle and let them go to town. Make sure you instruct your child to point the sprayer down into the dish or else you could end up with a table and chairs covered in bright red Kool-Aid! If it wasn’t freezing here, I would have done this outside so that he could have a little more freedom to go wild with it. However, he still had a blast and there was very little mess. Because there is flour mixed with the baking soda, the chemical reaction isn’t so great that it overflows from the dish. However it is still visible. About half-way through the activity I added a few big squirts of dish soap to the bottle of Kool-Aid to making a more bubbly reaction. The use of the spray bottle was an excellent way to exercise the muscles in Evan’s hand. It was quite a task for him after a while, but he was highly motivated and continued to spray until the Kool-Aid ran out. After he was done spraying the fizzy dough, he used a spoon to mix everything together. It ended up turning into a red goop. 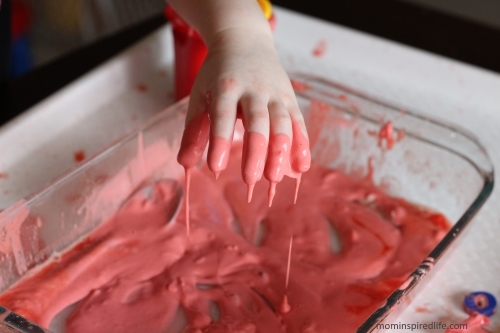 After some coaxing, he dug in with his hands in and had a great time playing with the gooey mixture. This was a total hit! 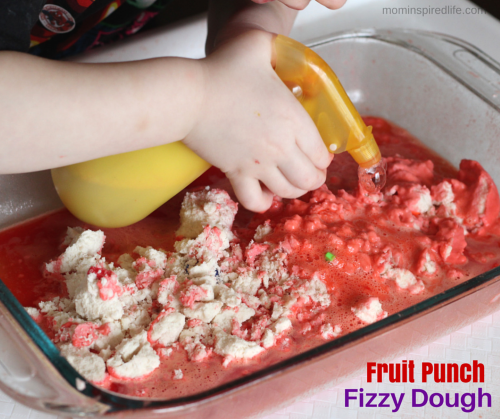 We both had a great time exploring and playing with this fizzy dough!